Catherine Russell is a New Yorker, born into musical royalty. Her father, the late Luis Russell, was a native of Panama who moved to New Orleans and then New York City, becoming a pioneering pianist/composer/bandleader, and Louis Armstrong’s long-time musical director. Her mother, Carline Ray, an outstanding bassist and vocalist, has performed with Mary Lou Williams and International Sweethearts of Rhythm. 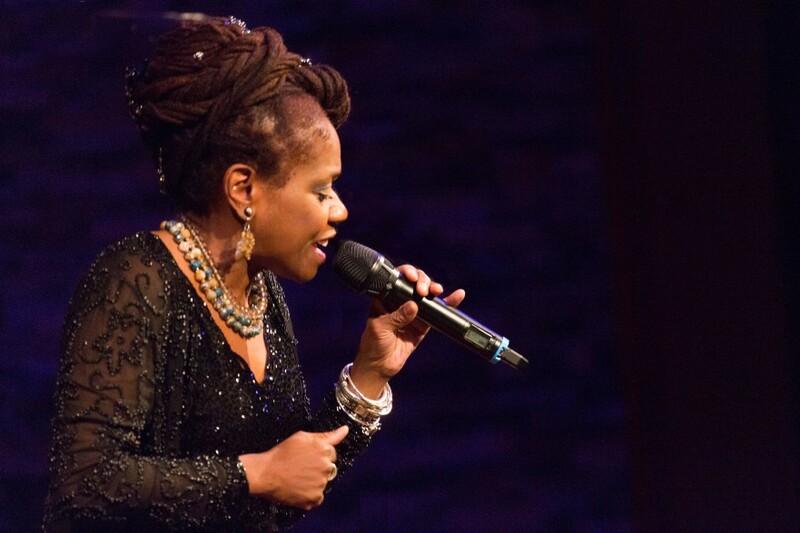 Considering her roots and family pedigree, it’s no surprise that Catherine Russell is a one-of-a-kind singer and musician. Cat is in demand as a backing singer and multi-instrumentalist, having performed and recorded with artists including Steely Dan, Levon Helm, David Bowie, Cyndi Lauper, Paul Simon, Jackson Browne, Michael Feinstein, Carrie Smith, and Rosanne Cash.Of her debut album “Cat”, (World Village/Harmonia Mundi), she made critic and Sinatra biographer, Will Friedwald’s top 10 list who stated “She is a fresh and original voice. The most exciting debut album I’ve heard in a long time.” “It’s a delight to hear the real thing in Catherine Russell”, wrote the dean of jazz writers, Nat Hentoff, in The Wall Street Journal.Catherine Russell’s second album on World Village, “Sentimental Streak”, was released in 2008 to universal acclaim, hitting the Billboard and I-Tunes Jazz Charts, and JazzWeek and Living Blues Radio Charts. Cat was a guest on “Late Night with Conan O’Brien” and NPR’s “Fresh Air”. She won the prestigious German Record Critics’ Award in the Jazz category and Living Blues magazine’s 2008 critics’ poll as “Artist Deserving More Attention.” L’Acadamie du Jazz in France chose “Sentimental Streak” as finaliste for Prix du Jazz Vocal 2008, while Grammy Award winning writer and jazz critic Francis Davis picked “Sentimental Streak” as Vocal Album of the Year in the 2008 Village Voice Jazz Critics Poll. Catherine Russell’s “Inside This Heart of Mine” is a personal selection of gems from the 1920s through the Present; vital interpretations, bursting with soul and humor. Deepening the approach of her previous recordings — an off-the-beaten-path song selection, sparkling small group acoustic swing, and a stunning vocal approach — with “Inside This Heart Of Mine”, vocalist Catherine Russell joins the ranks of the greatest interpreters and performers of American Popular Song.